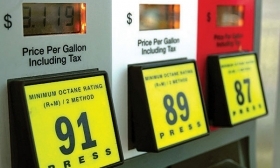 Editor's note: An earlier version of this story misstated the final years of the Obama administration and when new U.S. fuel economy standards went into effect. Canadian automotive suppliers were told Wednesday they are in danger of being left alone on a “technology island” if the United States rolls back fuel economy standards. U.S. President Donald Trump and his administration are intent on lowering the standards for 2022-2025 model year vehicles, reversing the progress made by former president Barack Obama. During the final days of the Obama administration, the U.S. Environmental Protection Agency finalized the 2022-2025 corporate average fuel economy standards calling for a projected 51.4 mpg by 2025, C02 emissions levels of 173 grams per mile, and hefty fines for violators. The administration used auto bailouts during the 2008 and 2009 recession to get automakers to agree to better fuel economy standards. The move prompted automakers to complain that the EPA did not properly evaluate all the data regarding costs and consumer acceptance of new technologies. Now, Trump is looking to flatten those regulations. It that happens, it could spell trouble for automakers and their suppliers, Michael Robinet of IHS Markit Automotive warned during a presentation at the Automotive Parts Manufacturers’ Association conference in Windsor. He said 20 to 30 years ago, North American automakers and lawmakers weren’t advancing fuel efficiency as quickly as their European counterparts, where diesel, for example, was a big part of the mix. That left automakers and their suppliers based in Canada and the United States alone “on an island,” Robinet said. “But, we caught up,” he said. While Canada is pursuing its own tough climate change policy, including a separate national electric-vehicle strategy, it still aligns its fuel efficiency standards with those of the United States. And, about 80 per cent of vehicles manufactured in Canada are shipped to the United States. Most suppliers build for the market in which they's located, or at least a market that is close to them, Robinet said. That means, suppliers in Canada manufacturer parts used in North American. Weaker standards would limit the size of supplier's market; or make it hard to expand overseas, for example. “If [fuel] regulations flatten out, you start to have disparity between different markets. This is a major issue,” Robinet said. “If you’re a domicile supplier in North America and you are asked to go global, it’s a competitive disadvantage.